Have you ever watched Blind Dating? It is a romantic comedy film starring Chris Pine, Eddie Kaye Thomas and Anjali Jay. Maybe some of you have never heard of those names, but it's ok coz i'm more concerned about the Story. It is about an intelligent, handsome, charming young blind man who signed up for a dangerous experimental procedure: brain surgery that may give him partial vision. Having been blind from birth, he volunteers for a risky experimental procedure that may restore his sight -- having a microchip installed in the visual cortex of his brain that connects to a camera that would give him only, at best, fuzzy black and white images. Later, he fell in love with a girl and he would do anything just to see that woman who made her heart beat, even to the expense of his life. To be able to see her eyes, her smile and the way she grin will surely mean the world to him. Now, his dream might finally come to reality with the use of with the use of Wicab BrainPort - a gadget that allow its users to see using their tongue. The latest invention of neuroscientists from Middleton, Wisc.-based Wicab, Inc. represents a gadget that can help blind or those with extremely low vision to see using their tongue. 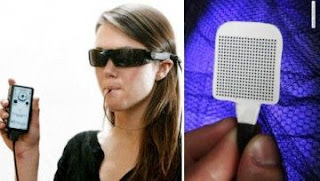 The Wicab BrainPort collects information gathered by a small digital camera mounted on a pair of glasses and then transmits it to a "lollipop" electrode array which the user attaches to their tongue. The device's digital camera sends the light information to a base unit that has the size of a usual mobile phone. Afterwards the small base unit translates the light information into electrical impulses, thus substituting retina's function. Then the base unit transmits that information to a set of 400 microelectrodes that are positioned on the paddle placed on the user's tongue. The article in Scientific American explains that the microelectrodes excite the nerves on the surface on a person's tongue. Those, who have already tested the latest invention, enjoyed the feeling of Pop Rocks candies on their tongue. It is also worth mentioning that the base unit of the device includes such functions as zoom control, light settings control and intensity. You can find more interesting information on various useful inventions here at www.InfoNIAC.com; please consider checking the links at the bottom of the story.With their help users can identify doorways and elevator buttons. Besides, the latest invention from Wicab researchers can help users read letters and numbers. In addition, the Wicab BrainPort allows seeing cups and forks on the table. This latest invention is expected to hit the market by the end of 2009. Its initial price will be about $10,000 per device. Lupet tlga ng infos. We have the same problem about comments on page. I have an idea on how to solve it, you may want to try it out. Remove the verification on your blog or open the comment window on another window. These are the options in blogger. Anyways, feature kita sa blog ko ha. Natutuwa kc aq sa mga infos mo eh. Anyways, just tell me what post you want to be featured. I've noticed that it is much better to direct traffic to your post instead of your homepage. It increases readability.